wholegrain butter biscuits (I used vanilla wafers, be creative) about 3 cups. You will need enough to cover the bottom a spring form pan. 2 cups plain Skyr (Icelandic Yogurt) or greek yoghurt if you can't fins Skyr. They sell many different types at Sprouts. Coarsely crush the biscuits. Mix them with sugar and melted butter/oil. Use a 8 inch spring-form cake pan. Fasten a piece of parchment paper between the ring and then bottom of the spring form. Use your hands to firmly press the crust out in the pan until it covers the whole bottom. Place it in the freezer. In a bowl combine skyr, honey and vanilla and mix it well together. Boil 1/2 cup of water in a pot. Remove from heat and pour in packet of gelatin and mix until desolved. Let it rest until slightly cooled. Mix the lukewarm gelatin with a little of the skyr and then gently mix it back into the skyr mixture. This little extra step with make sure that the gelatin does not shock the yogurt and make gelly clumps. Whip the heavy whipping cream in to a light and fluffy foam with a stand up mixture or hand help mixer. This will take about 5-8 minutes. Gently fold it into the skyr mix. Remove the crust from the freezer and pour the skyr cream on top of it. Gently smoothing out the surface. Place it in the fridge for at least 4 hours until completely chilled and set. Before serving, remove the cake from the form and transfer onto a serving plate. 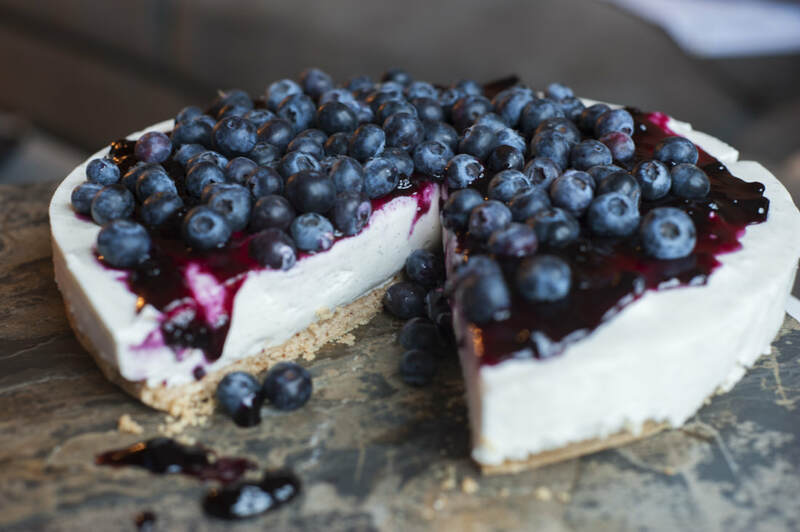 Gently spread our the blueberry jam on the surface of the cake and decorate with the fresh blueberries.